Heathrow’s £2.3 billion Terminal 2 is a world class act - not for nothing did it win ‘World’s Best Airport Terminal’ in the 2018 Skytrax World Airport Awards. Some of its appeal to passengers will be obvious – it has an amazing wavy roof, plenty of seats (7,106 to be exact), cool shops and eateries (including a café by Heston Blumenthal) and a colossal sculpture – Slipstream – that weighs 77 tonnes. 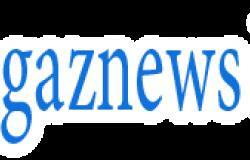 But some of its appeal will have registered with passengers on a subconscious level – and here were reveal how. MailOnline Travel persuaded the airport’s Head of Design, Barry Weekes, to divulge Terminal 2’s hidden design secrets, how the terminal’s architecture and décor gently calms passengers and even helps them navigate their way through the building. Terminal 2’s 540,000-square-foot wavy roof is eye-catching – but it serves a purpose, too. It helps passengers navigate their way through the building. It undulates upwards to give a sense of space in areas where passengers dwell, but goes down in areas where they have to do something, such as pass through security. Before Terminal 2 opened, it had undergone more than 180 trials with 14,000 volunteers taking on the role of passengers and providing comprehensive feedback on their experience. Heathrow's bosses also ran four end-to-end trials – with 3,000 volunteers in each – which put pressure on every element of the passenger journey from arrival in the car park to aircraft boarding. Each of these trials enabled the design team to make adjustments to Terminal 2’s signage, systems, staff briefings and even restaurant menus to improve the experience for passengers. 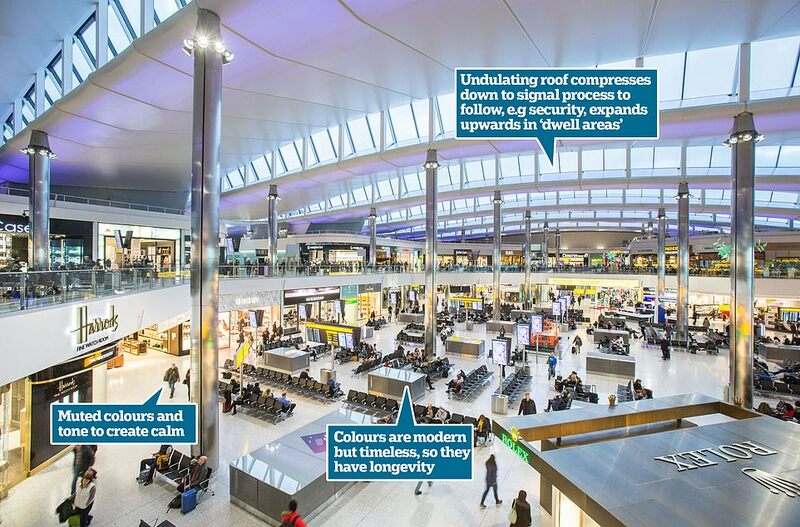 The footprint of Terminal 2 is 430,000 square feet – four times the size of Buckingham Palace. So that means that the designers had to be very careful about the pattern they picked for the floor tiles. If they got it wrong it would be an eyesore on a gigantic scale. And scuff marks would need to blend in, too. Intriguingly, the designers arranged the floor tile patterns they picked to give passengers subtle navigational cues. 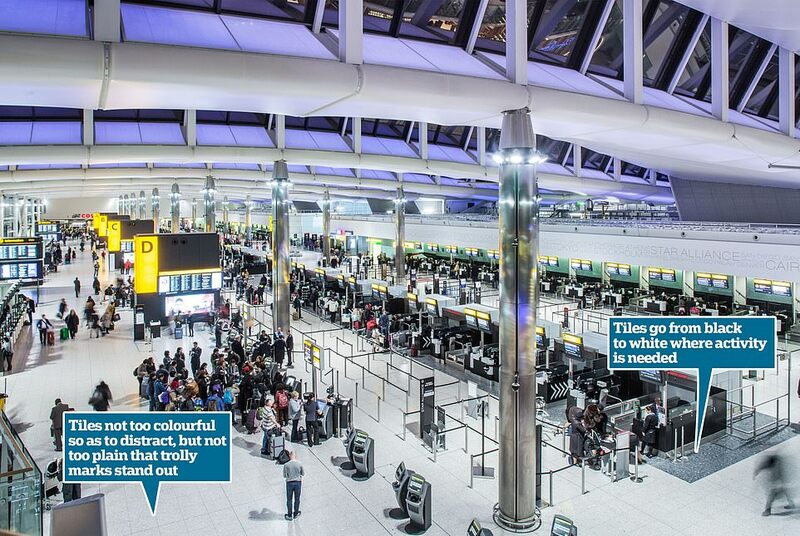 They go from white to black where there is an activity needed – such as checking in or entering a security lane.